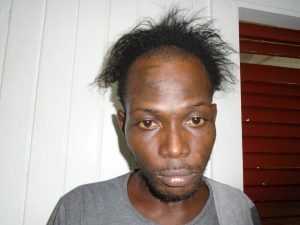 Another prison escapee was early Monday captured at a house at Mocha, East Bank Demerara, police said. He is Shawn Harris who had exited the swampy area of the Lusignan Prison through a muddy hole under the foundation of a wall. Head of the Criminal Investigations Department of the Guyana Police Force, Senior Superintendent, Wendell Blanhum told Demerara Waves Online News that Harris was caught at 6:18 AM. There was no confrontation between the fugitive and members of the Joint Services. No weapons were found at the house where he was caught. Harris is the third prison escapee to have been caught in less than 24 hours. The others are Kerry Cromwell who surrendered to police in the company of his mother. Prior to Cromwell handing himself in, police and soldiers shot dead Clive Forde aka El Sinkie during a confrontation at East Ruimveldt. Authorities said he opened fire on the lawmen. Police said a 9MM pistol was found near his body. With the capture of Harris, it means that four prisoners are still on the run. They are Uree Varswyck also known as Malcolm Gordon, Mark Royden Durant also known as Royden Williams and Smallie, Cobena “OJ” Stephens, and Paul Goriah.